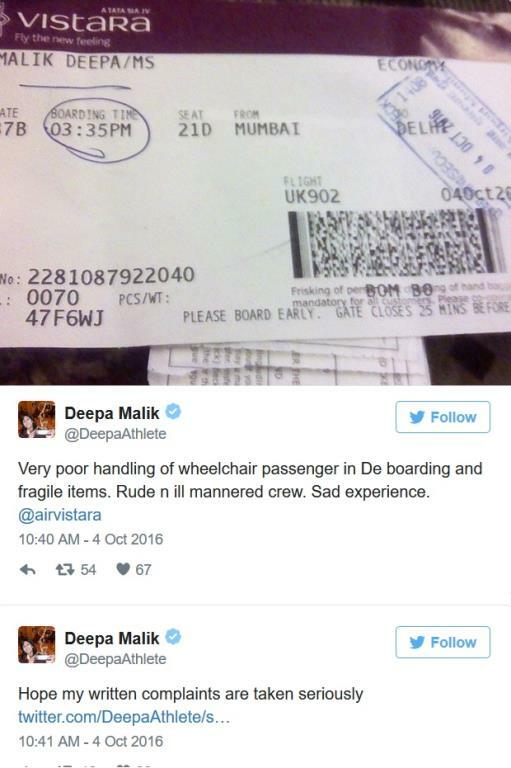 Deepa Malik, the wheelchair-bound athlete who won a silver medal for India at the recently concluded Paralympics in Rio, complained of rude behaviour by a cabin crew member of the TATA-SIA-run Vistara. The airline subsequently issued an apology. 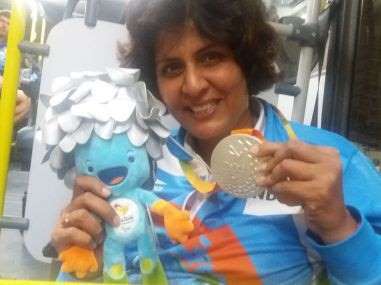 Malik, who became the first Indian woman to win a medal in Paralympic Games, was travelling on Vistara's Mumbai-Delhi flight UK 902 on Wednesday, when the incident happened. The 46-year-old complained about the "poor handling" of wheelchair-bound passengers by the airline staff. 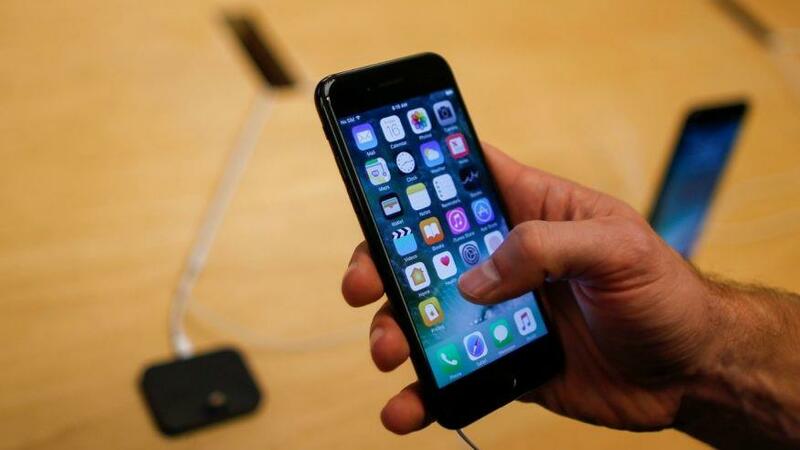 In her onboard written complaint to the airline, she alleged that one of the cabin crew members behaved rudely with her when she was informing her mother on the phone that her flight from Mumbai was delayed. "Crew member Priyanka was very rude in the flight. She told me to speak softly when I called parents to inform them about the delay in flight," she wrote in the complaint. 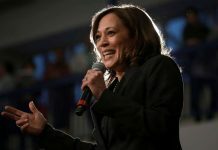 "On objecting, she said 'sweetheart, chill'," Malik wrote, adding that the airline's wheelchair handling was so poor that they didn't know how to shift a person from the seat to cabin chair. "The entire staff stands and looks at each other for 10 minutes. 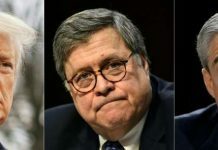 No action," she said. She alleged that the cabin crew was not ready to help her reach the cabin seat, as they were not trained. 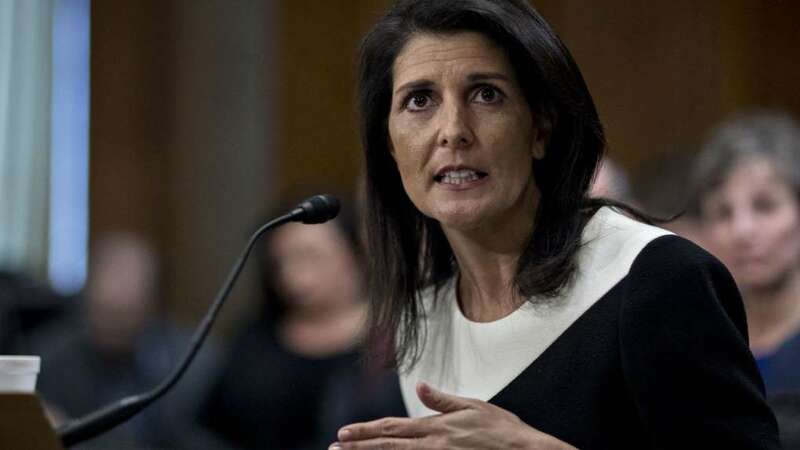 In a series of tweets, she also urged the airline to treat physically challenged passengers with dignity. She also tagged Union Social Justice and Empowerment Minister Thaawar Chand Gehlot in her tweets. She also mentioned that she hoped her complains were taken seriously. 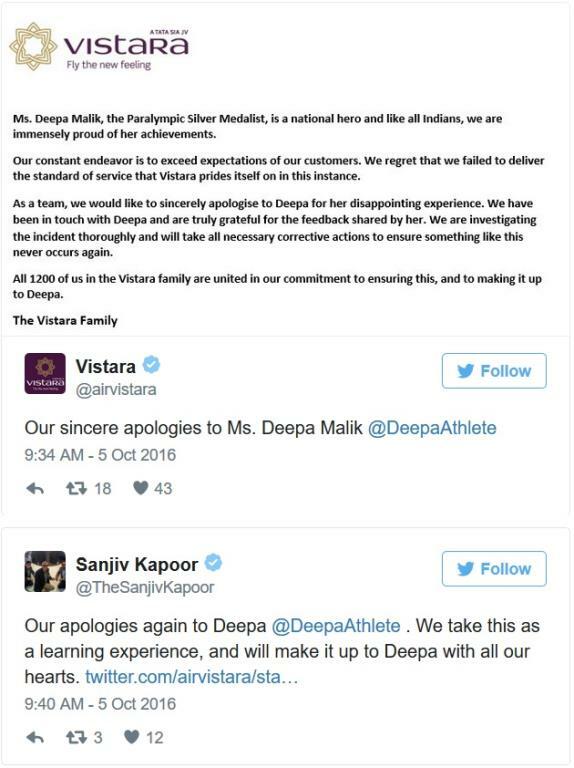 It would appear that they were, since both the airline and Sanjiv Kapoor, the chief strategy and commercial officer of Vistara, apologised to her publicly on social media. Vistara officials also visited the athlete, and the airline tweeted an image of their written apology to the Paralympian. Vistara also assured her of a through probe into the incident and necessary action. "As a team, we would like to sincerely apologise Deepa for her disappointing experience. We have been in touch with Deepa and are grateful for the feedback shared by her. We are investigating the incident thoroughly and will take all necessary corrective actions to ensure something like this never occurs again," Vistara said in a apology letter posted by them on social media. 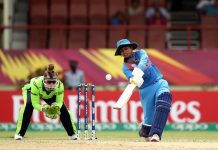 Malik accepted the apology, saying that the matter was now resolved. She also added that she was glad to see Vistara's positive response and prompt action.